This is a neat recycling craft and such a cool way to reuse those used dryer sheets! Just add a magnet, and you have an attractive butterfly note holder to attach to the fridge. Take one used dryer sheet and scrunch it up the long way in the middle, then clip it in the middle with the clothespin. Do the same with the other dryer sheet. Now you can stop here and just paint the clothes pin and add a magnet on the back of the clothespin or you can copy the butterfly in our picture. Take a brown pipe cleaner and wrap it around a pencil so it will be in a coil. Next, take a black pipe cleaner and fold it in half. Now slip one half of the black pipe cleaner through the brown coiled pipe cleaner and slip the other half around the middle of the dryer sheets. At the top of the brown pipe cleaner, twist the two black antennas together. Now take a pencil and wrap the two tops of the black pipe cleaner antennas just a little. Here comes the fun part! 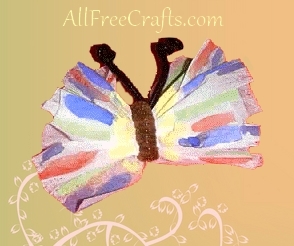 Take your water color paints and brush the butterfly wings with all different colors. Let dry and spray a little bit of perfume on if you want the butterfly to smell nice. Glue the back of the butterfly to the clothespin and when dry, glue on a magnet. Now you have a beautiful butterfly note holder for the fridge.